Fortunately, I don’t have to drive the interstate very often anymore. When I find myself stuck between white lines for a long drive, my mind melts into mush and I fantasize about escaping the madness in a flying car. There are two things I’ve always wanted to do while driving on the interstate. First, I’d like to drive through a rest area at full speed and just wave at all the shocked people getting out for a stretch. Second, I’d like to go through a truck weigh station. Even a dolt like me realizes the first dream is too dangerous and I would never do it. But the second… hmmm. I found myself so bored on a recent business trip through South Carolina that I thought it might be a good time to check out a weigh station. According to my calculations, I had plenty of time to get to my appointment and I always find South Carolinians to be extraordinarily kind. So when the exit sign appeared for All Trucks to be weighed, I followed a dingy yellow 18-wheeler off the road. I drive a pick-up – which is a truck, after all. The truck behind me started honking immediately – impatient, I guess. Nearly deafened by his horn, I waited my turn in the line. They go relatively quickly and I was on the scale in no time. When I got there, an angry looking lady in brown was waiting for me. “But it said, ‘all trucks’,” I countered with a smile, using my stupid-card, which I keep readily available in my wallet (and an extra copy in the glove box). “Goodbye, ma’am,” I said as I quickly obeyed. The officer must have been the forgiving type – I didn’t get pulled over for being stupid. However, the trucker behind me with the air horn took exception to my little prank. About two miles down the road, he was close enough to my truck bed to be considered cargo. I started to get nervous, but figured he wouldn’t keep at it too long if I slowed down to obey the posted fifty-five MPH speed limit. I was wrong. 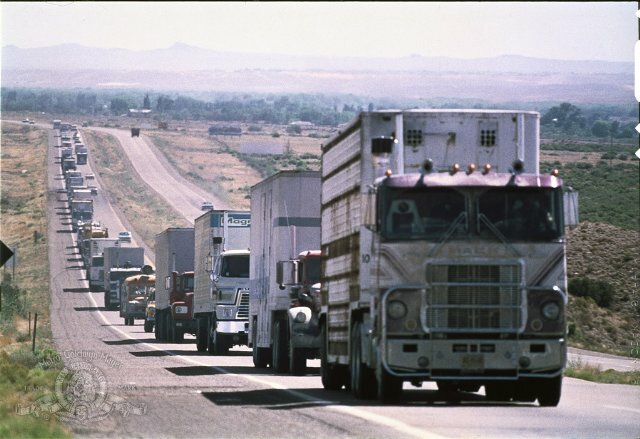 In fact, I think they still actually might have one of those CB networks they used in the 70’s to call a convoy. I say that because within a mile, I looked ahead of me and another truck was going even slower than me. No worries. I started to pass only to find a blue rig to my left going the same speed as the impediment in front. Talked about hemmed in. I was stuck… and going fifty miles per hour all the way through South Carolina. My ‘plenty of time’ evaporated and I nearly missed my meeting entirely. My little prank must have broken some kind of trucker code. Some stupid ideas should stay just that… as ideas. The next time I get bored, I’ll stop at Cracker Barrel for a book on tape… and I won’t park anywhere near the big rigs. Mark, I learn so much from you. Thank you. Your groundbreaking experiments allow me to feel better about living these ideas only in my head. And a question: have you considered starting a website similar to the Darwin Awards (http://www.darwinawards.com)? I sense an unhealthy – but amusing – synergy. Thanks for dropping by, Stuart. Glad you enjoyed. You have no idea how many times I wanted to do the exact same thing….but my Mazda Hatchback could never look like a truck…. Thanks for this. Made my day! I am positive they were laughing. But I couldn’t see a single one of them from my level. I assure, you I wasn’t laughing. i’m sorry but i spit out chocolate milk on my keyboard. i love this caper so much and the overreaction for the truckers. Mmmmm. Chocolate milk – tough to clean up. My work here is done. They just wanted to be friends, after all, you did sort of ask to join them! They have to have a license like mine then! hehe….